"1) First and foremost, a high–fidelity prototype gives you something realistic enough to try out your ideas with target users and customers before making a significant investment. This lets you discover which ideas are good and which are not, and if the product has real value, and also discover if users can figure out how to use the product. 2) Doing a high–fidelity prototype helps you – even forces you – to think through your product to a much greater degree than paper specs. 3) A high–fidelity prototype enables and encourages the type of collaboration between product manager, interaction designer, and architect/engineer that is necessary to discover a valuable, useful and feasible product. 4) A high–fidelity prototype provides the level of information necessary for accurate engineering cost estimates, early in the process when these estimates are most useful. 5) A high–fidelity prototype provides the engineers and QA organization with a rich, interactive description of the product's intended functionality and design to be used as a reference basis for implementation and test. 6) A high–fidelity prototype provides the rest of the organization – marketing, sales, customer service, business development, company execs – with a useful understanding of the product to come early enough in the process that they have time to do their jobs properly. 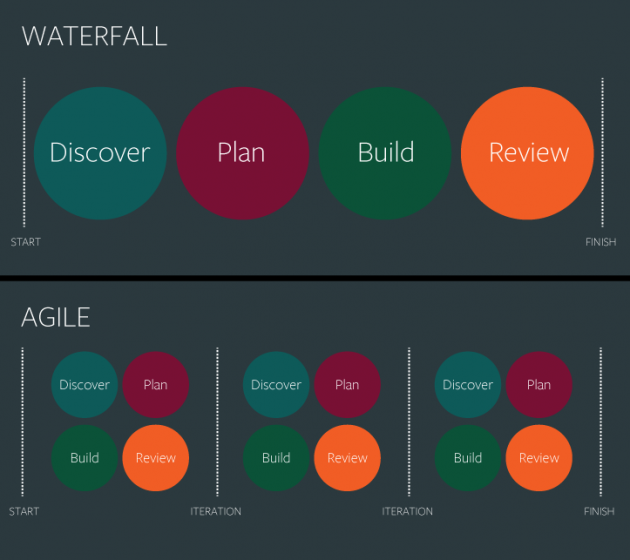 7) A high–fidelity prototype prevents the classic waterfall problem of doing design after the requirements, rather than realizing that functionality and user experience are inherently intertwined. 8) If you do a high–fidelity prototype and you test your ideas with users and you find significant problems, you will have saved your company the cost in terms of time and money of building something that would have failed. Not to mention the opportunity cost of what the team could have been building. 9) If you do a high–fidelity prototype and validate this with target users, you will significantly reduce the time it takes for your developers to build the product both because the product is better defined, and also because you will have been forced to resolve many of the questions early that otherwise throw a wrench into development. 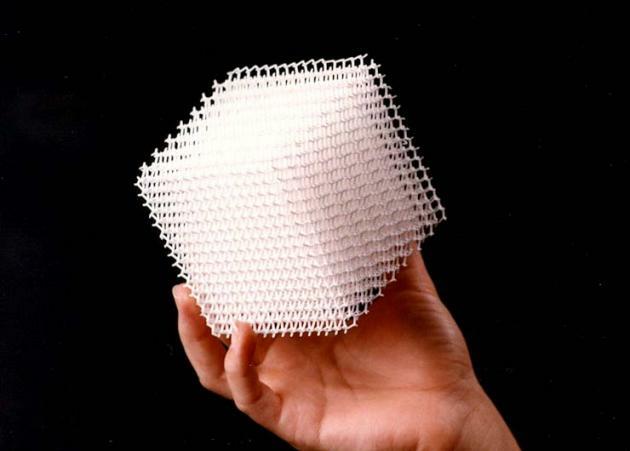 10) A high–fidelity prototype helps keep the focus of the team on the user experience." 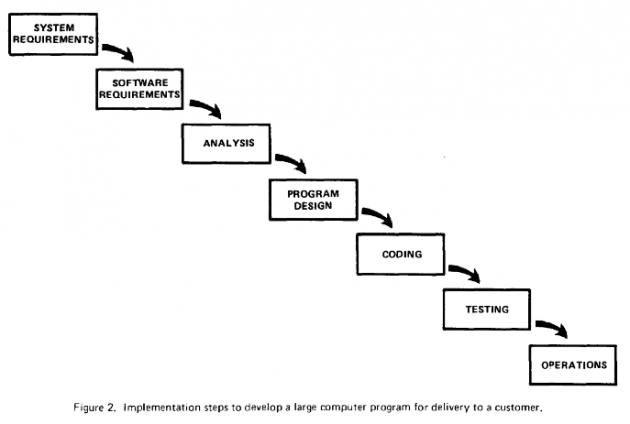 A more grandiose approach to software development is illustrated in Figure 2. The analysis and coding steps are still in the picture, but they are preceded by two levels of requirements analysis, are separated by a program design step, and followed by a testing step. These additions are treated separately from analysis and coding because they are distinctly different in the way they are executed. They must be planned and staffed differently for best utilization of program resources." Figure 2 The "waterfall method" (one of numerous development models discussed by Royce in his seminal paper). Winston Royce (1970). "Managing the Development of Large Software Systems", Proceedings of IEEE WESCON 26 (August): 1–9. "'Whirlpool' projects embrace the fact that requirements are volatile. Instead of trying to deliver a system that satisfies 100% of the requirements in one go, the focus is on delivering an agreed subset of the requirements at intervals. Use cases are the building blocks of requirements and provide a convenient basis for risk assessment and prioritising. The riskiest and most significant use cases are tackled first, within the context of a clearly understood architectural vision. Tackling risk early identifies problems before they become too expensive or threatening, and helps lead to more stable architectures. The system evolves as a sequence of increments, each one an enhancement to the already–delivered functionality. The development process for each increment is founded on the idea of a workflow, consisting of activities. For example. instead of having an analysis stage followed by a design stage, a worker might be engaged in analysis activities and design activities, depending on the job in hand. It is important to recognise that analysis activities focus on the problem space, while design activities focus on the solution space. A good understanding of one part of the problem may well lead to faster progress to design in that area. It is also possible that design activities highlight shortcoming in the analysis or even the requirements, in which case these are amended to reflect the newer (and hopefully better) understanding. Successive iterations converge on a more complete, correct and consistent model, leading ultimately to implementation and delivery."